La Belle Irene was the stage name of Irene Woodward often refereed to as "The Original Tattooed Lady". Although there is some question to her claim of being the first female tattoo attraction, as early as 1882 the New York Clipper newspaper mentioned her working with G.B. Biennell. (a dime museum operator). Most attractions of that era invented elaborate stories as to why they got tattooed. La Belle said she got her tattoos in the 'wild west of Texas' as protection from the attention of the hostile Red Indians. 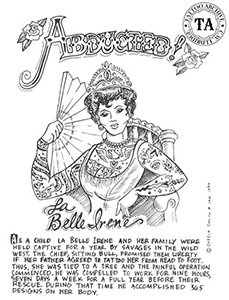 It is said La Belle Irene's tattooing was done by Samuel O'Reilly and Charlie Wagner of New York City.